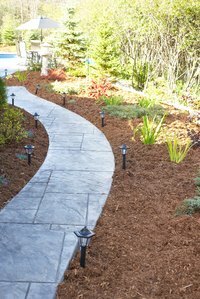 A sloped walkway is a way to add some flavor to your property's landscaping. Creating a walkway will make navigating a slope much easier. The walkway will also direct people to walk onit instead of the grass so there's little risk of damage to other areas of your yard or garden. Measure the length of the walkway you're going to build on the slope. Do this by laying down yarn the distance of the walkway. The width of the walkway should be about 4 feet. Lay down yarn for both sides of the width of the sidewalk. Draw along the two pieces of yarn with chalk so you can remove the yarn. Dig the entire length of the area inside of the outlined chalk. You should dig about 4 to 6 inches deep if the walkway will be used only by pedestrians. Place underlayment the entire length of the base of the dug out walkway. This will allow water to seep through, but will keep grass and weeds from growing out from under the gravel. Place anchor edging along both sides of the walkway. This will keep the sides from collapsing into the middle as you are working on the walkway. Take a 3-pound sledgehammer and hit it on the top of the anchor edging until the top protrudes a few inches out of the ground. Pack the dug out walkway with gravel. Start at the side that will be lowest on the slope. This will ensure that the gravel stays in place while you are packing it in. If you start from the top of the slope, you run the risk of some of the gravel coming loose and rolling down the unfinished walkway. Sweep the surface of the gravel to remove any loose pieces. Compact the gravel using a plate compactor. This ensures the gravel is tightly held together. You need to look at it every day for a few days to see if any of the gravel has sunk in. If so, add more and compact it using the plate compactor.